Use bacon with fatty strip. Brown those and a few cloves of garlic in some butter in a large heavy pan. Whilst that’s browning, cook spaghetti according to packet instructions (I normally add a drizzle of olive oil and some salt). Prepare the carbonara sauce by stirring together a cupful of cream, six egg yolks, freshly grated parmesan cheese, salt and pepper. When the pasta is cooked, drain and pour into the frying pan. Stir well to coat the strands with the bacon fat. Turn off the heat. Pour the carbonara sauce over it and stir again until properly mixed. We all know that those flavoured drinks are soooooo bad for you, because of the high sugar content and preservatives. Yet on warm days, they are sooooo irresistible! Boil filtered water and steep two tea bags in it (use caffeine-free tea if you prefer). Mash up some strawberries and pour it into the tea. 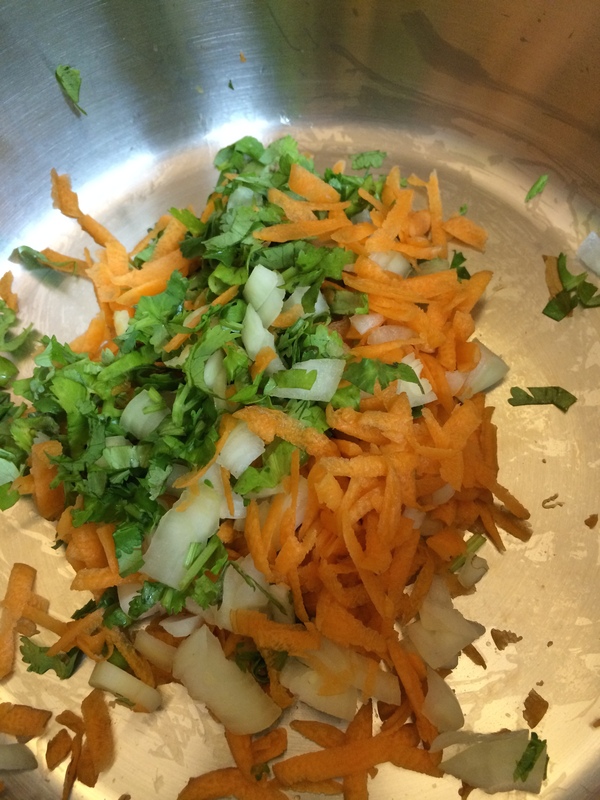 Squeeze and orange in the mixture and add crushed mint leaves. Add honey to taste. In an ideal world, we eat fresh organic vegetables straight from the garden. But the real world is not ideal. Allocate a day where you have two hours to spare. Source fresh organic vegetables. Clean and chop. Then put in freezer boxes and freeze immediately. These are great for midweek dinners. I use mine to make soups, and it takes 2 minutes – i.e. open the freezer, reach for a box and put in a soup pot. Onion, tomatoes, carrots, squash, marrow, brussel sprouts, sugar snap peas, herbs (lots of herbs like parsley, basil, rosemary, thyme). Note: I vary the content of my freezer bags and use funky items. 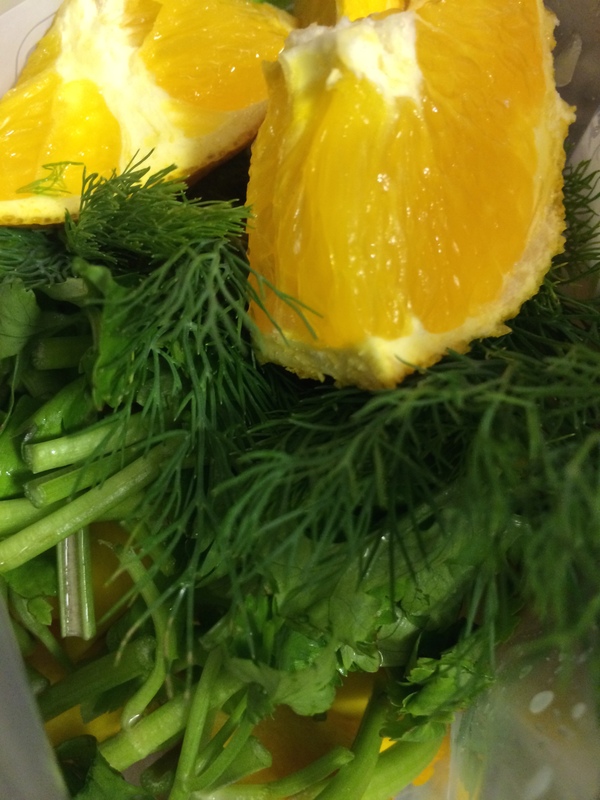 Dill and orange make delicious, unusual chicken soup, so delicate! Or just blend it as it is! Modern life is all about convenience and unconscious living because the world is so fast-paced. If you have children, I bet you have a bottle of tomato ketchup in the house. I do. But yesterday, we can out of ketchup. Rather than drive down the shops in the rush hour to pick a bottle up, I decided to whizz up some ketchup with the ingredients I have at home. My teenager wasn’t that impressed, but when I showed her what goes into the bottle of famous-brand ketchup that we normally have in the house, she decided that mum’s homemade ketchup was not so bad after all………. Roast about 10 ripe red tomatoes, 3 cloves of garlic, half an onion and a red capsicum (these are what I had at home) drizzled with olive oil. I roasted the ingredients to give it that lovely smokey smell. Transfer to a saucepan. Add a bay leaf, a splash of burgundy wine, a tablespoon of vinegar, salt and a pinch of sugar. Simmer to desired consistency. Store in a sterilised jar or use immediately. It’s not too bad. It’s quite good, actually. But I may try a simpler version to make it more synthetic tasting so that it resembles something that comes out of a plastic bottle! There is nothing more tempting than a thick, chunky soup on cold days. With winter coming, here’s an idea for you to try. Normal soup thickeners are cornflour and ordinary flour, which are zero value nutritionally. Try using grated carrots and perhaps half a potato if you like your soup super-thick. If you add other vegetables and herbs, and boil until those disintegrate, you end up with a rich, delicious soup. There’s some very beautiful alchemy going on. Just perfect for winter or the rainy season. This is a first for me, and the combo tastes surprisingly delicious! I used: kangkung (water spinach), pak choi and Thai basil. All three leaves are intensely green, which means laden with nutrients. 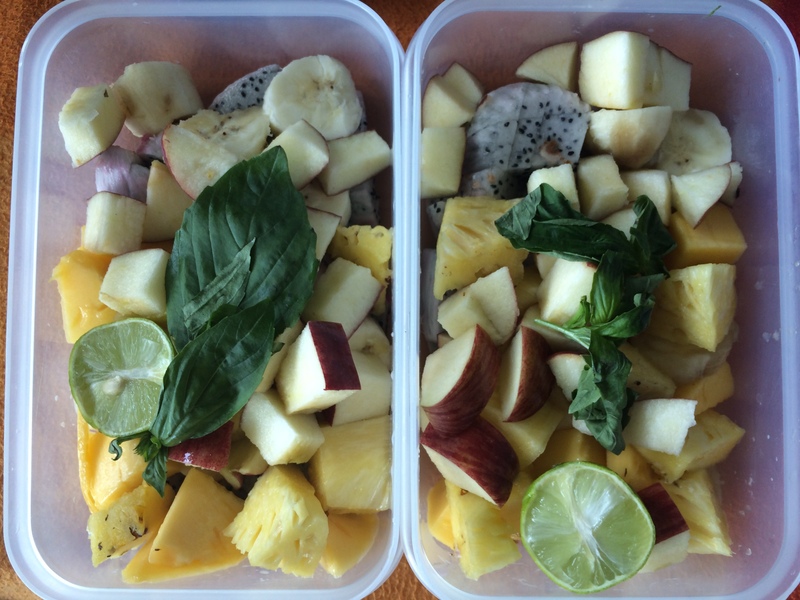 To make the taste palatable, I added an apple and a pineapple. Cheers! Note: there are some contraindications to eating kangkung raw because of the parasite Fasciolopsiasis buski, a large parasitic intestinal fluke that can be found as larval cysts laid on the water spinach (and other water vegetables). However, I think if you have a strong immune system and undertake a parasite cleanse regularly, you will be protected when eating clean organic kangkung. If you feel more reassured, replace kankung with ordinary spinach or other greens. One of the most common regrets of parents in the developed world is the lack of time to spend with their children when the children were growing up. For these precious childhood years, when gone, are gone forever. You would have missed the most magical part of your children’s lives. And yours, too. Yet not all parents who would like to spend the whole day baking or reading with their offspring are able to do so, because economics drives at least one parent out of the door into the world of work. If one chooses to live in an expensive city such as London, the household often requires two working parents to keep it afloat financially. I would like to write a little piece on heart-centred capitalism. I am not trained in classical economics, though in my varied career, I once worked for an investment bank where I managed over U$800milion in equities for institutional clients. I, the scientist/medic, ended up working in an investment bank because I needed to pay the mortgage on my Knightsbridge flat. It cost me dear. It led me to think, maybe economics in the capitalism-as-we-know-it framework does not work? Many men – and I am being sexist here – work for big corporations. The so-called multinationals, which are often as large as a small country, proudly trumpeting their global reach as well as their ability to understand the local markets. But do these conglomerates practice what they preach when it comes to their employees, or are they proletarian in nature? In the olden days, these powerful large companies use their considerable assets to look after their employees, providing loyal staff with cradle-to-grave job security. The company was like one big, happy and close family where members look after each other. I do not think that mentality exists now. The world is more dog-eat-dog, more competitive, and the job market is more fluid. Technology has changed a lot of things. Big structures have found to be unwieldy and unsteady, as the former Soviet Union proved, and as the current precarious state of the European Union shows. The economic crisis of 2008 was yet another indication that we have to rethink our current framework. I do not think global economy has fully recovered from 2008, and we are bearing the pain through a rising pension age for the workforce, privatisation of education and healthcare, and a huge burden of debt for many ordinary young people. For me, this smacks of a return to slave capitalism that predates industrial capitalism. But if you look beneath the surface, you will find a thriving alternative economy based on collectivism and solidarity. If you are a parent, you would be familiar with carpooling. You would be familiar too, with babysitting arrangements with other parents. You might even do group-buys. Expand that into the world of work, and you get Wikipedia, which has $3billion in revenues, which put the encyclopedia business out of existence, which was built solely on collectivism. In 2006, Mohammad Yunus won the Nobel Peace Prize. He developed Grameen Bank. Grameen Bank lends to those that commercial lenders would not touch: the bank is founded on the belief that people have endless potential, and unleashing their creativity and initiative helps them end poverty. And despite never ever having any legal agreements with those whom it lends money to, there have been very few defaulters. Contrast that with the now defunct Lehman Brothers. We are still paying back Lehman’s fallout one way or another. Isn’t it about time we rethink capitalism? Do we live to work until we are 70 years old, merely to buy the things that we do not need or a lifestyle that we do not want? I am hoping to persuade my partner that after over a decade of serving as a loyal servant in the corporate world that he should step out of it and into this wonderful place with me where we will live on fresh air, sunshine and love. This is the time to abandon the sinking ship of slave capitalism and dissolve the punishing market forces to create a paradigm of parallel currencies, cooperatives, non-market products and shared resources of heart-centred capitalism. We will live well, and with meaning. Parenting is a very personal journey, and I am sure I will be slated for this post. However, I will still post this, because I would like to see a shift in mindset towards raising healthy kids. Each time your child whines, “Carry me” and you give in, you are not ‘spoiling’ your child emotionally. You are de-skilling your child. You are taking away his opportunity at that moment, to learn resilience. You are also not giving him the opportunity to work on his developing muscles. Let us start from the scientific angle. Children need to develop muscle tone. It is that muscle tone that allows a flexible foetus to be curled up in the womb, to develop into a baby who could sit up, crawl and eventually walk upright. The primary muscles required for this is the group of muscles that are loosely referred to as the core muscles. The core muscles can be visualised as a broad belt encircling the human body. Weak core muscles are the cause of bad posture, which over time, can lead to chronic back pain. For a child with weak core muscles, you see slouchy sitting position (exacerbated by hours sitting down). A floppy child is also often tired, because in that suboptimal position, he is not breathing efficiently. Her internal circulation may also be compromised. She may not be as active as she should be for her age group. Having weak core muscles is certainly not a good foundation for a young body that still has many decades of living to get through. As children do not go to the gym to strengthen their core muscles (and there is no need to), they need to walk at every opportunity. On the emotional development side, children also need to learn to be resilient and self-sufficient. By three – yes, during the Terrible Threes – they should be learning about their body and the world they live in. Walking is one of the fundamental movements in life, and it also moves a child towards being independent from the mother. It empowers them. Children need to move for their brain development, and being attached to a parent like a limp rag doll does not constitute moving. It is also about learning boundaries. Children need to know that there are certain things in life that they have to do for themselves, which Mummy cannot do for them. And walking is one of them. Teaching boundaries to children is one of the challenges of parenting, namely how to teach them with love so that they grow up joyous. For me, over the course of five children, I discovered that it is with love, laughter, firm rules, consistency, joy, forgiveness and unconditional love that we teach our children that they have to accept parental autonomy. Parenting is not about giving in all the time, but a healthy balance of meeting your child’s needs as well as teaching him the things he needs to learn. So if you have a child who is older than three, I would like to suggest trying to do away with the pushchair/stroller and see the changes. You will thank me in a few months time … big smile. Photograph: 2 year old Georgina trying to keep up with her parents and siblings in foot-high snow.